Whether I’m cool enough to be considered a nerd or not, I still have a soft spot in my heart for them. I admire brainiacs. In school, it’s pretty easy to tease and disdain the brains, but I always found them more interesting and inspiring than the more normal, more popular, and more accepted kids. If you share that view at all, you’ll love Quantum Hoops. 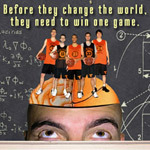 On the surface, Quantum Hoops is about the 2006 Caltech basketball team and their record 21-year losing streak. The last time the Caltech basketball team won a game was in 1985. And although the 2006 team is still losing, they’re losing by 10 and 20 points instead of by 50 and 60 points. David Duchovny, former child prodigy and basketball player, narrates with a detached, ironic drawl that works great for the subject. The unspoken message of the film is that, as much as America loves its college athletes, the scholars are just as driven, determined, interesting, and successful (more so, in my opinion). David Liu, a guard on the 2006 team, takes us around to the labs and shows us the high-tech tools and toys available to Caltech students. He’s working on a project to make fuels less explosive when there is a spill. Another player gives us a tour of the dorms, operating on 36 hours without sleep — just classes, homework, and basketball practice. Greenwald also looks up former players for Caltech. Huck Seed showed great promise on the court, but he left Caltech to pursue a career as a professional gambler. I forget what sort of illustrious career Fred Newman pursued, but he made it into the record books after graduating by setting world records for most consecutive free throws, most consecutive blindfolded free throws, most free throws in 10 minutes, and most free throws in 24 hours. As much as I liked the characters in Quantum Hoops, there is too much filler for my taste. Greenwald presents facts and figures about Nobel prize winners, about the history of the school, about the rigors and culture of Caltech, and about the history of the athletics program. These bits help complete the picture of Caltech, but they also seem to pad out the movie to a suitable feature length. By the end of the movie, Greenwald brings us back to the basketball court and the end of the 2006 team’s season. I won’t spoil the ending for you (don’t look it up on Google, either), but Greenwald is able to send the audience off with one of the most nail-biting, edge-of-your-seat finishes to any sports movie I’ve seen. Quantum Hoops is a must-see for friends and family of Caltech alumni, and for anyone else who thinks that nerds are some of the most interesting people in school.